U.S. Chamber of Commerce President and Chief Executive Officer Thomas Donohue. Two main business lobbies in the U.S. plan to publicly challenge White House foreign policy regarding Russia by taking out advertisements in the nation's top three newspapers to warn that imposing additional sanctions against Moscow will only harm U.S interests. The U.S. Chamber of Commerce and the National Association of Manufacturers plan to run ads Thursday in The New York Times, Washington Post and The Wall Street Journal to say a potential new round of sanctions, which President Barack Obama is contemplating, could hurt U.S. businesses and workers, USA Today reported Wednesday. The ads do not name Obama but speak about "some U.S. policymakers," Bloomberg reported, citing a copy of the ad provided by an unidentified person familiar with the plans. Jay Timmons, the president and CEO of the National Association of Manufacturers, says in the ad that his group was "concerned about actions that would harm American manufacturers and cost American jobs," USA Today reported. "The most effective long-term solution to increase America's global influence is to strengthen our ability to provide goods and services to the world through pro-trade policies and multilateral diplomacy," Timmons was quoted as saying in the ad. The ad — presenting a joint statement by Timmons and Chamber of Commerce president Thomas Donohue — also says that "the only effect" of additional sanctions would be to "to bar U.S. companies from foreign markets and cede business opportunities to firms from other countries," Bloomberg reported. Similar opposition to sanctions had also come from European business groups, while France has rebuffed U.S. appeals to cancel its plans to sell two Mistral helicopter carriers to Russia, citing the jobs that the $1.6 billion contract had helped create. The prospect of the U.S. moving forward with sanctions alone is particularly worrying to the manufacturers' association, its vice president of international economic affairs Linda Dempsey said, USA Today reported. Instead of dissuading Moscow from supporting Ukraine's pro-Russian separatists, unilateral U.S. sanctions would "single out U.S. industries and workers," damaging their competitiveness against foreign companies, Dempsey was quoted as saying. A similar line of reasoning has been advanced by Russian politicians and state-run corporations leaders. Head of Rosneft oil giant Igor Sechin told Germany's Handelsblatt this week that "sanctions will not help anyone," and that imposing them would hurt Western countries by letting competitors from the "Asia-Pacific region" — such as China — take over their share of the Russian energy market. U.S. business groups have reportedly spent the past few months raising their concerns over Russia sanctions during private conversations with senior administration officials. White House National Security Council spokeswoman Laura Lucas Magnuson said the administration has had "frequent conversations with business leaders on this issue since the beginning of the crisis to understand their concerns," Bloomberg reported. However, the ad will mark the first time the top business groups raise their objections so publicly. While the possibility of sanctions harming U.S. industries is a concern shared by administration officials, supporters of the new potential round of penalties maintain the measures would target sensitive areas of Russia's energy, defense and financial sectors without straining the U.S. economy, The Associated Press reported. The Obama administration appeared willing to delay imposing new sanctions after Russia's upper chamber of parliament on Wednesday granted Russian President Vladimir Putin's request to revoke the right it had given him this spring to intervene militarily in Ukraine. U.S. Secretary of State John Kerry called the move Wednesday "a great step," but cautioned that "it could be reversed in 10 minutes, and everybody knows that," The Washington Post reported. 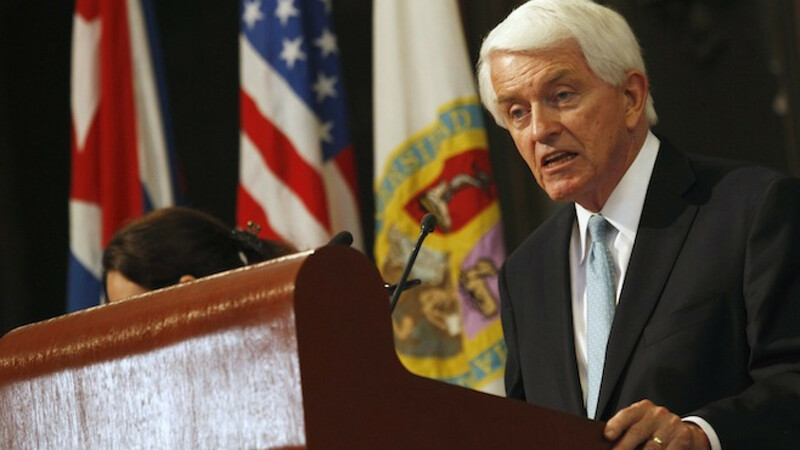 In the main, the U.S. Chamber of Commerce tends to oppose the Obama administration, spending more than $3 million on a series of television ads to support Republican candidates for the U.S. House, The New York Times has reported.